Issued Dec. 1, 2009, to Harmonix Music Systems, Inc. 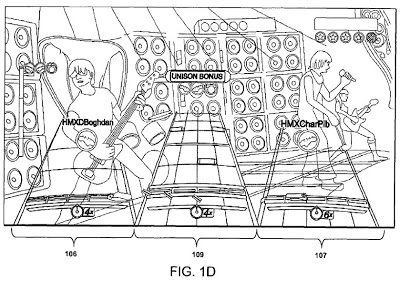 The ‘284 patent describes the visual concept for games like “Rock Band” or “Guitar Hero,” where a player’s cues are given via a colored highway where the necessary buttons are displayed. The invention here involves using a drum kit during the game. During the game, a player has his own lane which corresponds to his instrument. Each player in the game will be given their own lane which will then be split into different sections (corresponding with the different buttons the players have available). The drum kit features several different pads (which all correspond to color cues that travel along the player’s highway) and also includes a bass pedal which will be required whenever a solid line is displayed along the highway. The player needs to press the buttons in time with the music in order to gain points throughout the game. Systems and methods for displaying cues indicating input actions in a rhythm-action game may include: displaying, to a player of a rhythm-action game, a lane divided into at least two sub-lanes, each sub-lane containing cues indicating a drum input element; and displaying, to the player, an additional cue spanning a plurality of the sub-lanes, the additional cue indicating a foot pedal action. In some embodiments, the additional cue may span all the sub-lanes. In some embodiments, each sub-lane may contain cues indicating a drum input element of a set of linearly arranged drum input elements. In other embodiments, each sub-lanes may correspond to a fret button of a simulated guitar and the additional cue may correspond to an open strum. 1. A method executed by a game platform for rendering, on a screen display, a foot-pedal cue in a rhythm-action video game, the method comprising: a. displaying via the screen display, to a player of the rhythm-action video game, a lane divided into at least two sub-lanes, each sub-lane containing cues indicating a drum input element; b. displaying via the screen display, to the player, an additional cue spanning a plurality of the sub-lanes and not confined to a distinct sub-lane, the additional cue indicating a foot pedal action; and c. displaying via the screen display, to the player, a cue contained within a sub-lane and overlaid over the additional cue spanning a plurality of the sub-lanes.